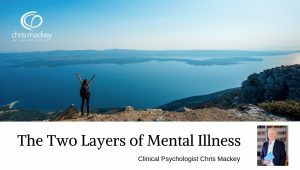 When people seek therapy for a problem, often there are two layers to the issue they’re confronting. There is the psychological problem itself, such as anxiety or depression. But there is also the client’s emotional reaction to the issues they’re presenting with, often including guilt or shame. It is often the person’s non-accepting reaction to their psychological problem that makes it more difficult to have a quicker recovery.